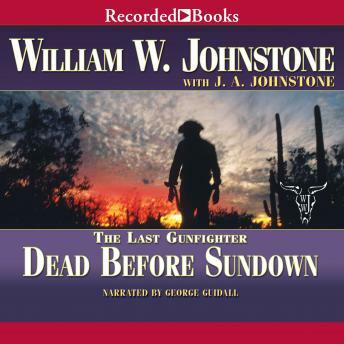 USA Today best-selling author William W. Johnstone is a legend in the Western genre. In this 22nd Last Gunfighter novel, Frank Morgan and a handful of survivors are stranded in Western Canada. An old enemy of Frank's has resurfaced, and with him a band of murderous Metis rebels armed with stolen U.S. Army Gatling guns. Now Frank and his ragtag bunch are the only thing standing between this dangerous foe and a bloodbath. I really don't like the narration of this book. The guy is very old sounding and doesn't change his voice much when he switches characters. Due to the narration, I just can't get into the story. Stopping at just over an hour of listening.